For those of y’all that missed the VR law panel a couple of weeks ago, the audio of the event is now up. Please use the link below to access it. Last Thursday NYVR hosted its 15th event. 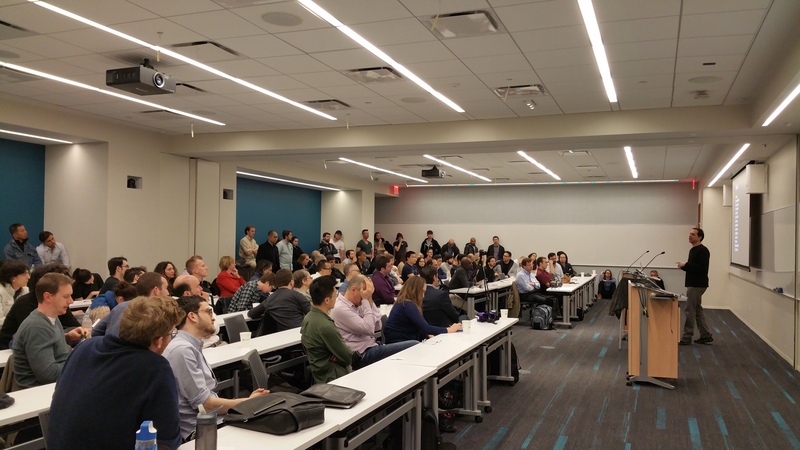 Over 200 people RSVP’d to gather at Microsoft’s NYC headquarters to hear the latest VR news and share ideas with some of VR’s luminaries. 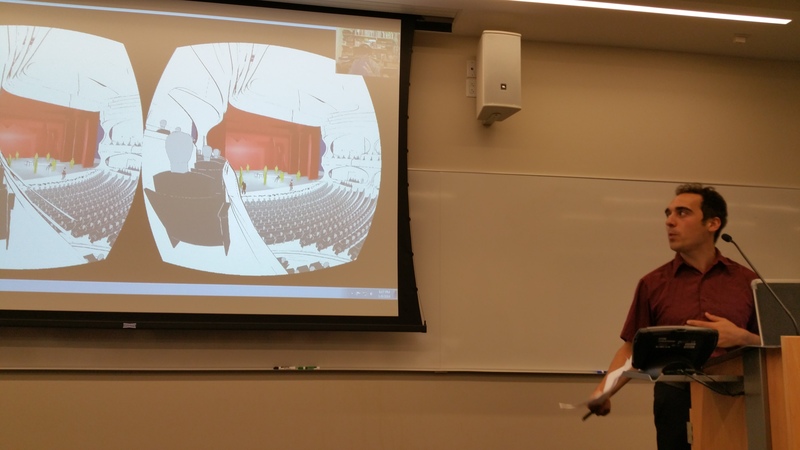 The night opened with Alex Coulombe’s story of how he used VR to solve a nagging problem in theater design. Alex is an architect (among other things) with a firm that specializes in designing theaters. One of the issues they face in their design process is how to assess seating layouts to ensure all comers get a good view of the action. Alex integrated Unity into his firm’s workflow to quickly create VR simulations of proposed layouts viewable on the Oculus Rift and Google Cardboard. Alex’s presentation was inspiring both in that it told the story of how the unique characteristics of VR can be used to solve real world problems as well as the fact that before this project Alex was not a developer or coder. With the tools we have available VR development is accessible to anyone with the will to build. Our keynote of the evening was Ken Perlin, NYU professor and pioneer in computer graphics and virtual reality. Of particular note was his description of the VR holodeck he and his colleagues (and the graduate students!) are building at NYU. The NYU holodeck has sub mm scale tracking of a 25′ x 25′ space which is being put to use to create everything from art installations (Octopus Rift) to room filling simulations of atomic orbitals (my personal favorite). Ken’s talk also highlighted the importance of research for its own sake. Research can be done for the pure pleasure of finding things out without the need for a business plan or financial projections. We were lucky to have both Ken and Alex this month and I think we were all at least a little bit inspired. 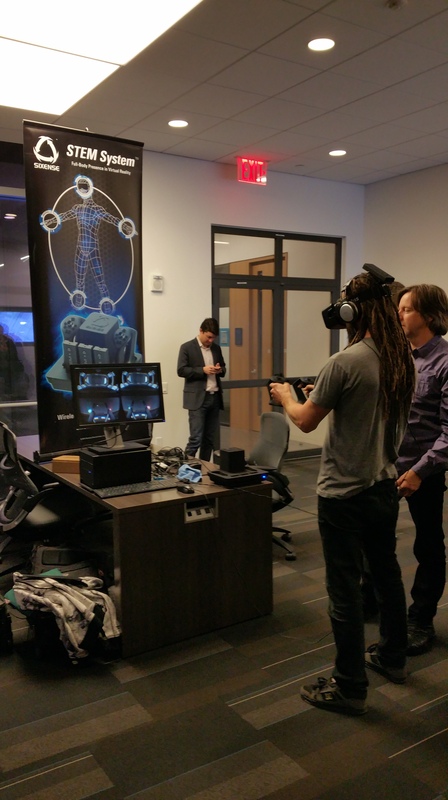 Also of note were a demo of Sixense’s jedi training, which was awesome, and a chance to touch base with Linden Labs and High Fidelity founder Phillip Rosedale. Thanks to everyone who came by and especially to the NY VR developers who demo’d their work. See you next month! OK it won’t really be an app in the traditional sense of the term (although I do expect a killer VR add-on piece) but it may well serve the function of one. What I mean is that the film could serve as a catalyst for the rapid adoption and mainstreaming of VR tech – the thing that makes the average consumer say “I need that.” If the movie is true to the book it will inspire a new generation with (and remind the old generation of) the promise of VR. So while we bide our time awaiting the consumer release of the Oculus Rift and Valve’s Vive, we should also mark our calendars for the opening night of Ready Player One. I think we will look back on that day as a milestone in the history of VR – the day everyone else realized that VR is real and that it’s going to change the world. 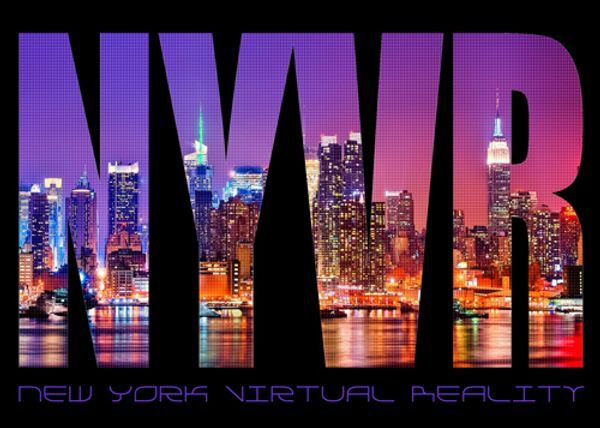 As part of our ongoing efforts to improve the NYVR group and facilitate the growth of NY’s VR ecosystem, we’ve developed a quick survey to gauge interest in some possible new NYVR events and get some additional info about the projects y’all are working on. It should not take more than a couple of minutes to fill out and it will be a great help to us as we plan to expand the offerings of NYVR. Thanks in advance for all of your help! Project SingletrackTM is the first iteration of the Velo VRTM virtual reality exercise platform created by Eric Greenbaum of Jema VR. 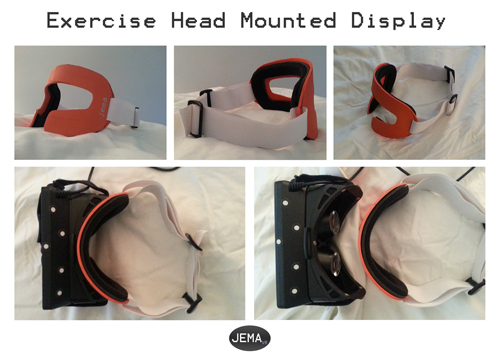 The current prototype comprises a head mounted display adapted for use during exercise, a variable resistance exercise bike, an RPM sensor coupled to the exercise bike, and a virtual mountain biking course. The exercise bike is coupled to the computer rendering the virtual mountain bike course such that user exercise input (RPM) translates to avatar movement on the virtual mountain bike course. 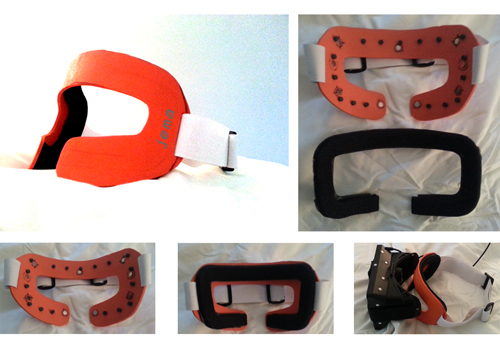 Total Cinema 360 is NY’s own full service 360 degree, virtual reality video production company. The NY VR Meetup has been lucky enough to try out some of TC360’s demos. My personal favorite was the kitten cam in which a bunch of young cats were frolicking around the camera (Kitten POV!) It seems that Adrian and Alex have been making the rounds and impressing people along the way. Here’s a link to a recent interview they did and a link to their website. 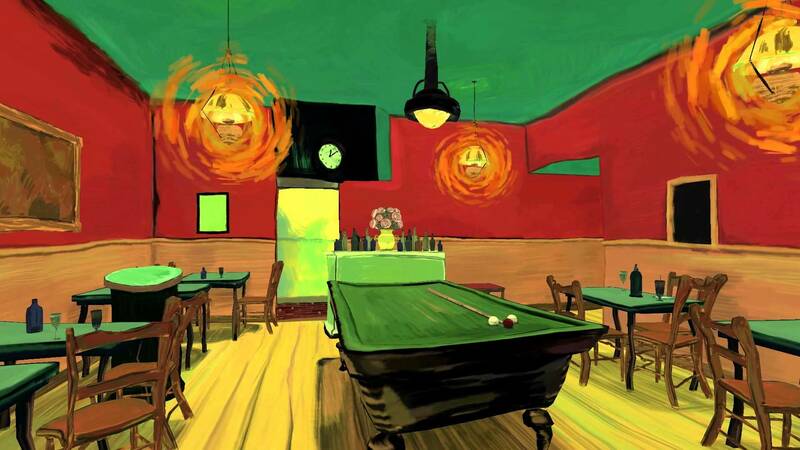 Come to the next VR Meetup and see for yourself!